It was a great blessing for me to come to the Norfolk Priory for a period of six months; from October 2015-April 2016 as a sabbatical. Mo. Angela Strobel with Sr. Lumen Gloria, chose this priory as a place to experience a monastic way of life, after being far away from our Punalur Community for a long time. Helping in the Infirmary was so delightful for me. 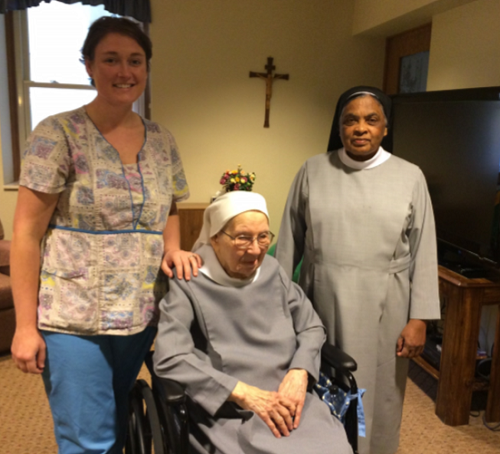 I became acquainted with our elderly Sisters. They are all aging so gracefully, trying to do what they can to contribute to Community Ministry. The Deacon Candidates and the Oblates enrich the Norfolk Priory Community. Their collaboration remarkable, and the Sisters in turn instill our Benedictine values to them. I read many books, watched and listened to many spiritual DVD’s, especially the Study of the Psalms helped me very much. Also I learned some craft work, coloring of mandalas, and crocheting pot holders. I enjoyed my quiet moments on Desert Days. While in Norfolk, I also enjoyed the snow days. Once we even had a blizzard, and even though I wasn’t brave enough to go outside, I enjoyed watching the snow from the windows. May the Spirit who guided me through these months, guide and direct me through my ministries to come. I take with me all the good things that I heard and experienced. I ask God’s blessings on Sr. Pia Portmann, Prioress, and on all the Sisters. I will always cherish the memories of the Norfolk Priory.